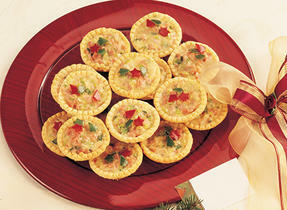 Savoury shortbreads make elegant nibbles to enjoy with a glass of wine or bubbly. These diamond shapes with glistening sea salt can help set a romantic mood for your celebration with your special someone. In large food processor, pulse red pepper until finely chopped. 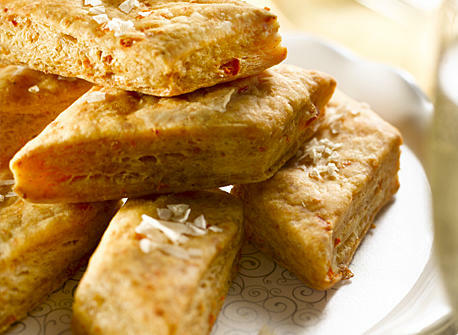 Add Canadian Old White Cheddar cheese, butter, flour, sugar, chili powder and salt. Pulse until dough starts to hold together, adding water a little at a time until dough holds together when squeezed. Turn out dough into a bowl and knead lightly into a smooth dough. Shape into a flat square. On a sheet of parchment paper with a floured rolling pin, roll out to a 9-inch (23 cm) square, about 1/2-inch (1 cm) thick. Slide onto a baking sheet and refrigerate for at least 20 min or until cold. Meanwhile, preheat oven to 300°F (150°C). Using a pizza cutter or a knife, cut square into 8 equal strips. On a diagonal, make seven cuts along each strip, about 1 inch (2.5 cm) apart, into 56 diamonds (there will be triangles at the ends of the strips – either press together into diamonds or bake as triangles). Lightly brush tops with egg white and sprinkle with coarse sea salt. Separate shortbread pieces on the parchment so they are at least 1/2 inch (1 cm) apart, using a second parchment-lined baking sheet if necessary. Ancho chili peppers are fresh poblano peppers that are dried. Ancho chili powder is a pure chili powder rather than a blend like regular chili powder, typically used for chili and has a moderate amount of heat. It can be find at well-stocked grocery stores and specialty spice or bulk stores. If you can’t find it, use 1/2 tsp (2 mL) regular chili powder and 1/2 tsp (2 mL) paprika instead. 125 people love this recipe.